Grapevine Cotons raises the rare Coton de Tulear, a breed developed over centuries on the Island of Madagascar as a small, intelligent, engaging, powerfully muscular, laid-back companion-class dog. We fell in love with these beautiful dogs after seeing them on TV and then we ran into a couple that had 2 of these dogs. We saw how devoted these dogs were to their owners and how friendly they were with other people. That was the start of our search for our beautiful Cotons and these lovely temperament dogs. What you will find at Grapevine Cotons are some very colorful Tri-Colored and Black and Whites. We have sought out these colored variations in our dogs because we love their color. We have two Tri-Colored and a Black and White dog so most litters will have color which is evident in our first litter. 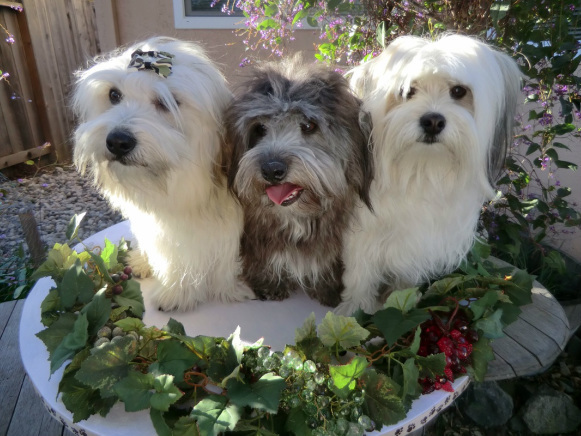 Grapevine Cotons raises the rare Coton de Tulear breed registered with the American Coton Club.